The Fulcrum B is a widely exported trainer version of the MiG-29. First flown on 29 April 1981and powered by two, Klimov/Sarkisov RD-33 turbofans, the MiG-29UB (Uchebnity=training, Boyevoy=combat) two-seat variant was designed to train pilots and support crews for the MiG-29. The radar was removed, but the cannon, IRST complex, laser range finder, and wing store stations of the single-seater remained. K-36DM ejection seats are installed. The one-piece canopy opens upward and is equipped with a periscope providing the rear occupant (IP) with a wide field of vision. Over 220 of the type have been produced. 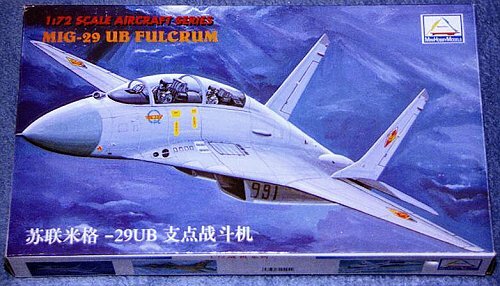 This is a Mini Hobby Models re-boxing of the Trumpeter, 1/72 scale, two-seat MiG-29UB Fulcrum B. Included are 73 parts molded in white on two sprues, five clear parts and a small tube of glue. Flash is obvious but minimal - it can be easily cleaned up - and there are few ejector pin markings that will be noticeable. For those who hate doing inlets two molded covers are included in the kit. Panel lines are engraved perhaps a bit heavy and several parts including both fuselage halves have a very rough, almost sanded texture. Cockpit detail is fair to good and the heavy raised instruments on both front panels should paint up nicely. The cockpit side consoles have some small details but the seats are rather plain looking with molded belts. Two small control sticks round out the pilotless cockpit. What passes for the HUD is molded onto the glare shield, there is no center brace molded onto the canopy - although there is the top-mounted periscope - and the forward brace is molded to wide. It’s definitely a tail sitter so I’ll add some weight to the nose. The landing gear seems strong enough at first glance and the detail is okay. Exhaust cones have fair detail but seem adequate in this scale. The air-bypass doors over the inlets are molded in the open position. At my first look I am concerned with fit, particularly with the inlets and forward fuselage. The instructions are diagram only with the exception of a small note not to use the included drop tanks or their pylons. I have seen photographs of the tanks mounted on the inboard stations of MiG-29UBs however. Called for in their place are two, R-27 (NATO AA-10 “Alamo”) radar-guided missiles (used for training in the Fulcrum B) for the inboard wing stations. Four, R-60 (NATO AA-8 “Aphid”) IR-guided missiles for the center and outboard stations round out the underwing stores. (Mounting holes are pre-drilled.) No painting references are provided other than the box art and a few shaded drawings in the instructions. This is in sharp contrast to the detailed instructions (and decals - albeit many being useless) provided in the Mini Hobby boxing of Trumpeter’s 1/72 F-5E I purchased at the same time. This box art shows markings for an East German MiG-29UB but I was surprised to find only ten totally useless stickers in the box - six red stars, two MiG Design Bureau logos, and two, blue number 10s. 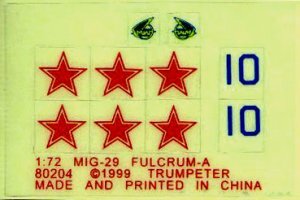 Notice they are marked MiG-29 Fulcrum-A from Trumpeter. I picked this kit up while deployed during Operation Enduring Freedom at a department store in Bishkek, Kyrgyzstan for 388 Kyrgyz som at 41 som to the dollar. I’m sure it can be purchased cheaper in the States. The small problems noted above are certainly fixable but I’m only somewhat satisfied with this kit out of the box and can’t recommend it. I do believe it’s salvageable and plan on practicing some of my rusty techniques on the kit since the USAF has been keeping me away from the workbench (and my family) recently! For those wanting more detail (and decals) you should skip this one. Maybe my wife can use the stars for our children’s chore calendar!